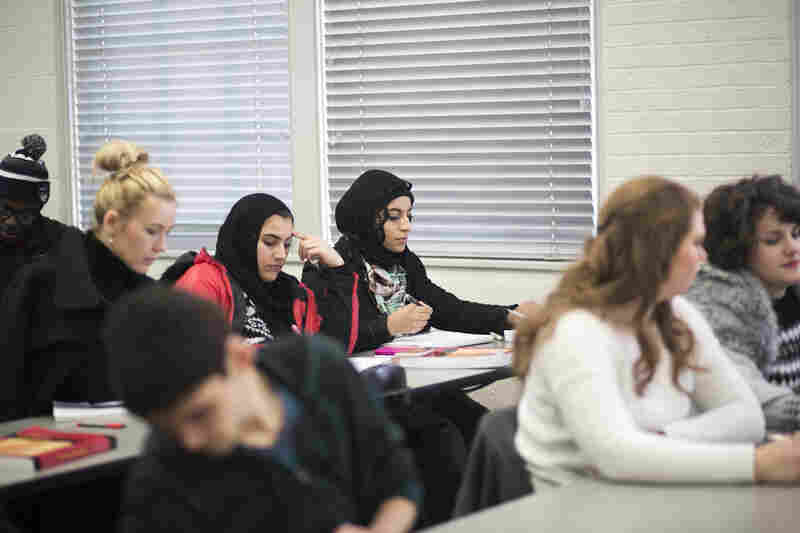 How Low Oil Prices Are Changing Career Plans At An Ohio College : NPR Ed Students come from all over the world to study petroleum engineering in southern Ohio and Marietta College. In the past nearly every graduate had a good job. Not any more. 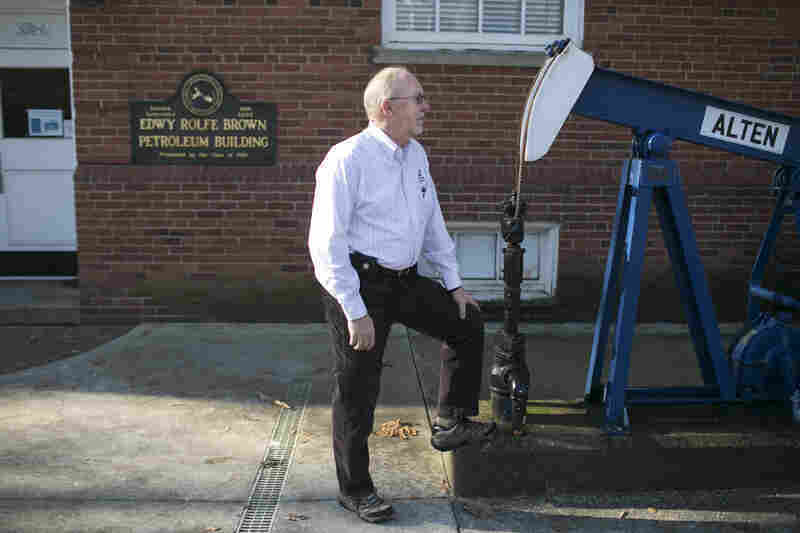 Dr. Robert Chase, former chair of the petroleum engineering program Marietta College, stands next to an oil rig on campus in Marietta, Ohio. Marietta College has one of the best petroleum engineering programs in the country. Dave Freeman teaches enhanced oil recovery to petroleum engineering students. 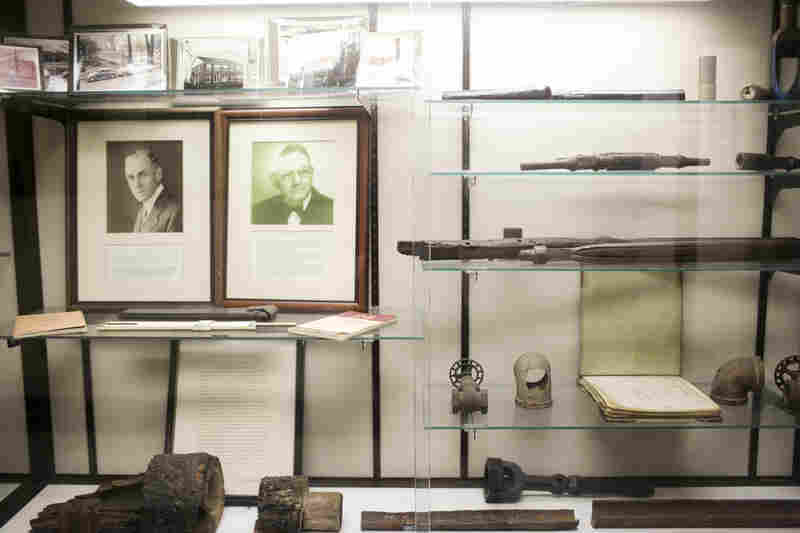 Artifacts on display at Marietta College. In the past, nearly every one of the program's graduates has scored a good job in the surging energy field. But not this year. 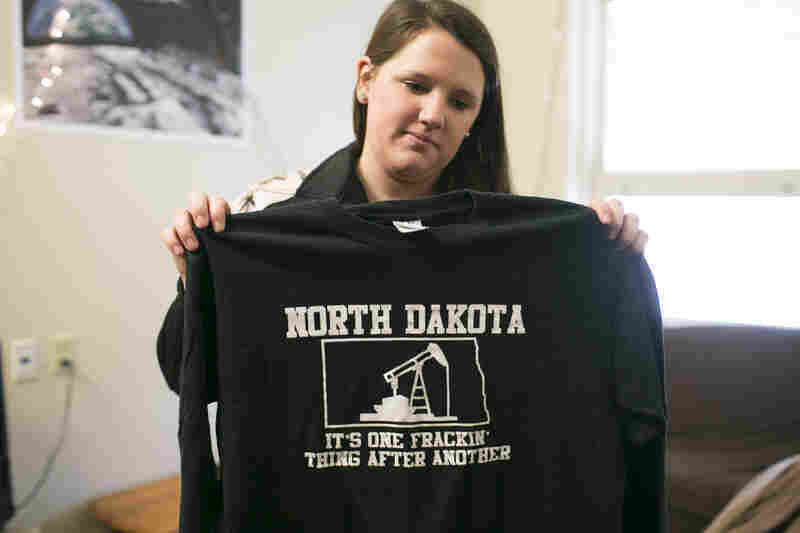 Taylor Debee, a senior petroleum engineering major at Marietta College, holds a shirt from her internship. Debee interned at Murex Petroleum Corporations in North Dakota. 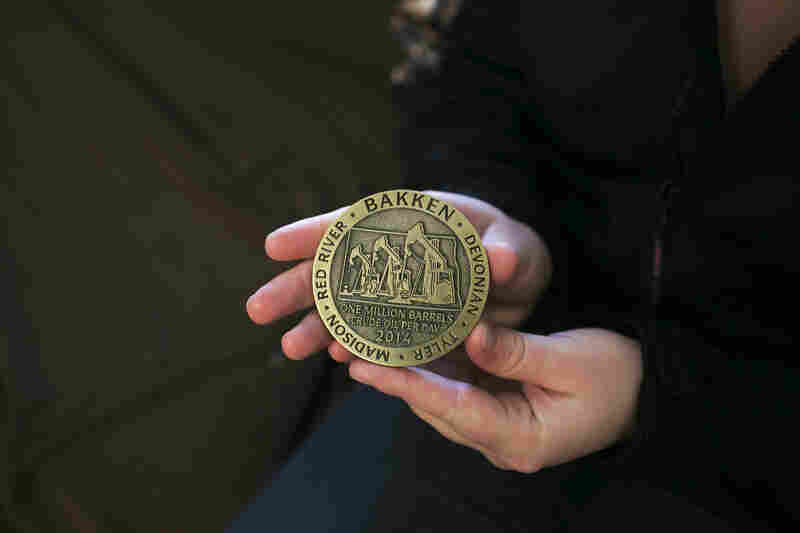 Debee holds a medal she received during her internship. 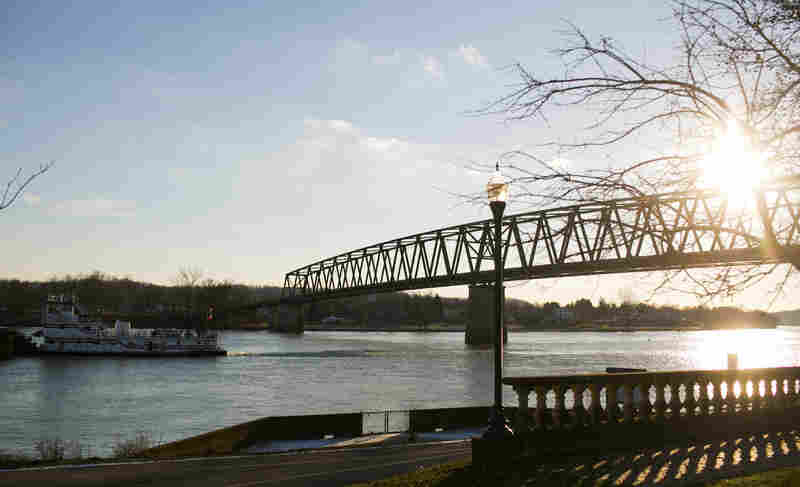 The college sits right next to the Ohio River. 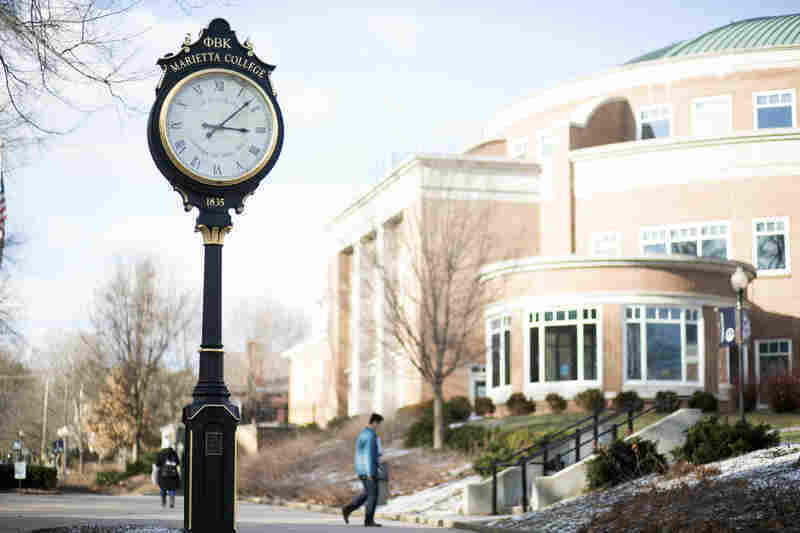 Marietta College has earned a global reputation for its program in petroleum engineering, drawing students from as far away as Kuwait, Saudi Arabia and China to this liberal arts school in southeast Ohio. In the past, nearly every one of the program's graduates has scored a good job in the surging energy field. But not this year. As the price of oil has plummeted, companies are cutting back on production and expansion, and cutting into Marietta's placement rate. Katie Plas, scheduled to graduate in 2017, thinks she'll be OK. Her grades in the petroleum engineering program are top-level, and her freshman summer internship — a key element of the program — was exceptional. It's like a gold star on a resume. 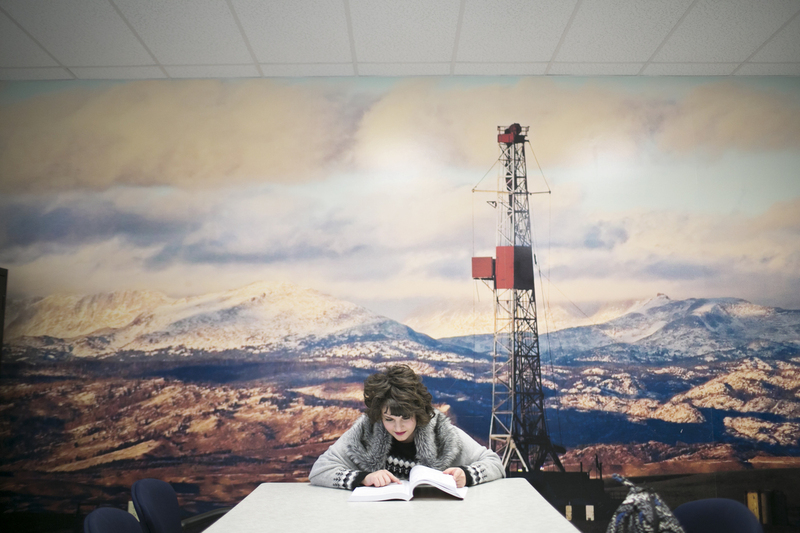 Katie Plas, a junior petroleum engineering major at Marietta College, studies before class. She worked as a roustabout in Arkansas. Plas says it was dirty work, and sometimes dangerous. 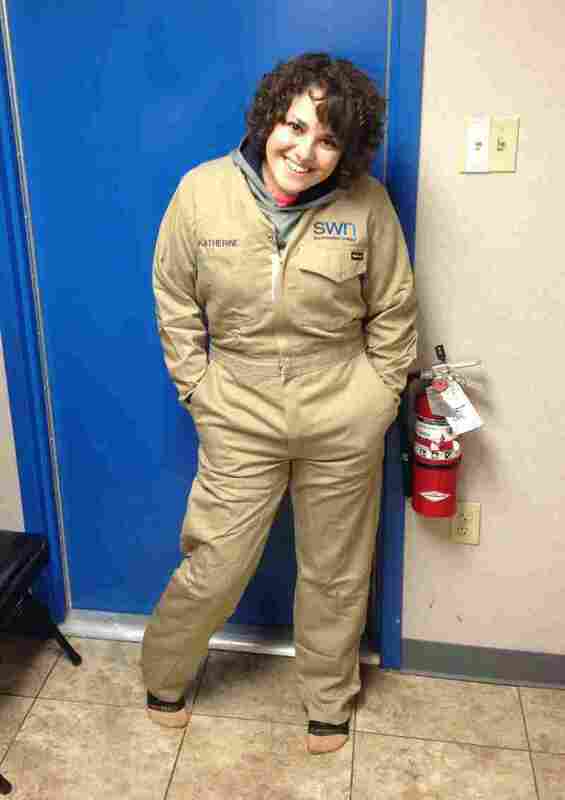 "I wore flame-retardant clothing, all day long. And it gets rather hot especially when it's a hundred degrees." She was 19, using a sledgehammer, grateful for the growing-up work on her family's Ohio farm. In the oil field she lived in a "man camp" apartment, which was one-third of a steel shipping container. 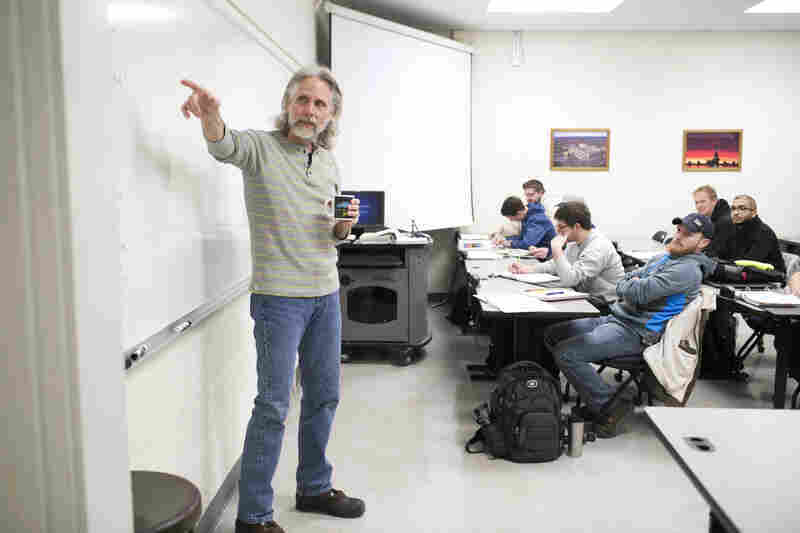 Around the oil rigs and pipelines, the college textbook pages could come alive. She would think, "This is what I learned in class." And then the roughnecks would say, '"Well, this is how it actually works." She feels confident she'll come out of the program next year with a job, but in the current economy many of her classmates may not be so lucky. This spring, perhaps only 30 to 40 percent of graduates from the program will have jobs waiting. And enrollment in September could be off by half. Other big universities with petroleum programs — the University of Texas at Austin, Penn State and Texas A&M — say their numbers are down, too. And so Marietta students like Jack Glime are watching the market carefully. "The price of oil now is like probably 33 percent of what it was when I got accepted into the petro program," he says. "It's a day-and-night difference." The petro students are required to take history, philosophy, writing and communication courses, which may give them a leg up in shifting career choices. Nicholas Villaveces, who'll graduate this year, says he's considering law school. "Patent law is something I'm looking into right now," he says, "and being a liberal arts student is definitely gong to put me at an advantage, and being an engineer, when I apply to law schools." That notion would make Bob Chase smile. He's just retired as chair of the petroleum department after 37 years. "I've got former students that are attorneys, I've got former students that are doctors, believe it or not," he says. "One of my students who went on to become an anesthesiologist made the comment that you'd be amazed at how a capillary is similar to oil flowing through a pipeline."